I love dressing up this time of year. I may not be going to the fanciest of parties, but I will always find a reason to dress up. Heck, last year I went to the pub in the sparkliest, fanciest dress I’ve ever owned and I bloody loved it. Christmas and New Years is the one time I feel like I can go extra on the outfit, and I don’t care how OTT I look. I’ll go to the supermarket in my ball gown if I feel like it. Christmas and New Years is all about the party dresses. Velvet, sparkles, or my favourite sequin dresses, you name it, I’ve done it all. 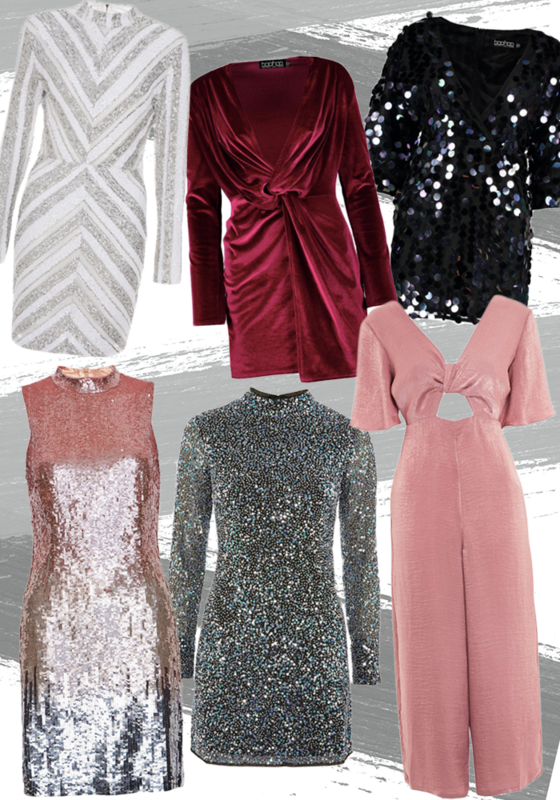 I’ve put together a lovely little wishlist of my favourite partywear on the highstreet right now. Start as we mean to go on, this White and Silver Turtle Neck Dress from Quiz is the ultimate glam number. If sequins aren’t for you then perhaps the Berry Velvet Twist Dress is better suited. I love dark reds and berries this time of year – pair it with a dark lip and you’re good to go. This Boohoo T-Shirt Sequin Dress is ideal if you’re looking to have a bit of food and want to hide any food babies. It’s important to feel comfy to enjoy a night out – sometimes bodycon isn’t always the way to go! I’m very much feeling this ombre Mini Sequin Dress number, and as if I haven’t pointed out enough sequin dresses yet, this Galaxy Sequin Dress really trumps them all. Finally, dresses aren’t for everyone, and you can look just as fabulous in a jumpsuit like this Satin Knot Jumpsuit from Topshop – I love the colour and the satin still gives a bit of sparkle so it’s a total win-win! What are you going to be wearing this festive season?